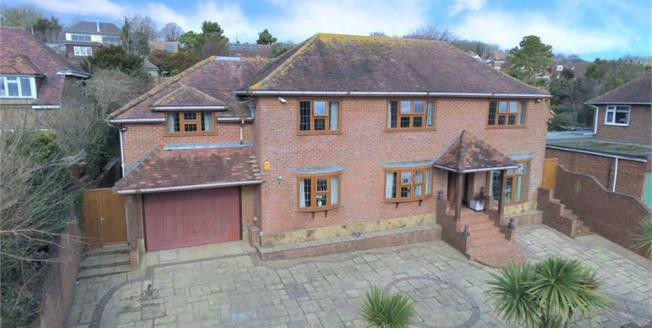 Stunning detached family home in sought after North Lancing. This substantial property has generous room sizes throughout, heated swimming pool, 35ft lounge and a fantastic open plan kitchen and family garden room for entertaining. There are panoramic views across Worthing including sea views and it's right on the foot of the South Downs National Park, perfect for walks. This truly grand house comprises large lounge, separate dining room, open plan kitchen / family room and a study. Upstairs there are 6 really good size bedrooms and two family bathrooms, one with a separate shower. Outstanding views from the front of house bedrooms need to be seen to be believed. Outside at the rear is a wonderful landscaped garden leading to an indoor heated swimming pool. To the front plenty of off road parking and an integral garage. The location provides easy access onto the A27 for both Brighton, Worthing or a commute to Gatwick or London. You also have local shops, supermarket, schools and Lancing mainline train station close by. This would make the perfect family home and viewing early is highly recommended.